I use a precision jewelers saw to cut out mother of pearl and abalone shell for inlaying items like guitar fretboards etc. As this is an expensive piece of equipment the shallow tray formed in the inner tray is an ideal place to store the tool. 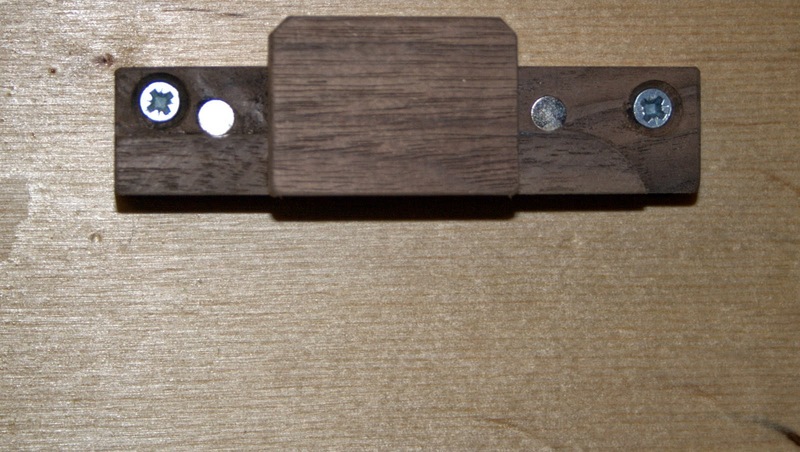 I fabricated a simple hanger from some more scraps of walnut. Using some smaller rare earth magnets, this time 6mm diameter (1/4") x 1mm thick (0.04"), to secure the steel frame of the saw into place. 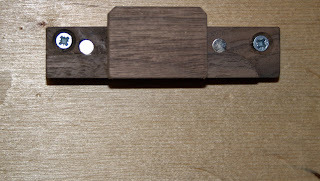 The hanging bracket was screwed into place and the saw has that satisfying "click" when the magnets engage when hung in place. There are two small rare earth magnets glued in. Jewelers saw hung in place. The space inside the saw frame will be used to store a small engineers square. None of the hangers have yet been finished. as many hangers as I can.